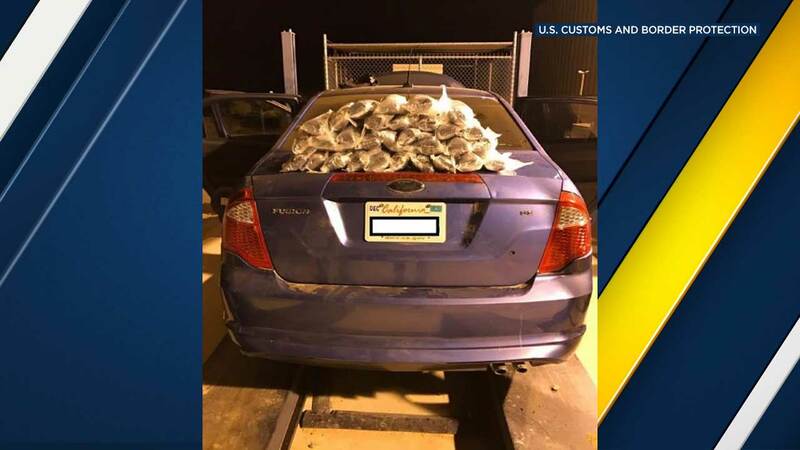 SALTON CITY, Calif. -- Border Patrol agents in Salton City arrested a man who they say attempted to smuggle more than 40 pounds of methamphetamine in the gas tank of his car. According to agents assigned to the Highway 86 checkpoint, a 19-year-old U.S. citizen approached the checkpoint in a blue 2010 Ford Fusion Monday around 3:40 a.m. He was referred to a secondary inspection, during which a K-9 team alerted to the undercarriage of the car. Upon further inspection, agents discovered 30 packages concealed in the gas tank of the vehicle. The substance inside the packages tested positive for methamphetamine. In total, authorities found 43.46 pounds of methamphetamine, which has an estimated street value of $173,840. The man was arrested and turned over to the Drug Enforcement Administration for further investigation. Since fiscal year 2017, which started Oct. 1, 2016, El Centro Sector Border Patrol seized more than 317.63 pounds of methamphetamine, the U.S. Customs and Border Protection said.